Our school values are also an explicit part of our RE curriculum. The aim of Religious Education in our school is to learn about and learn from religion. 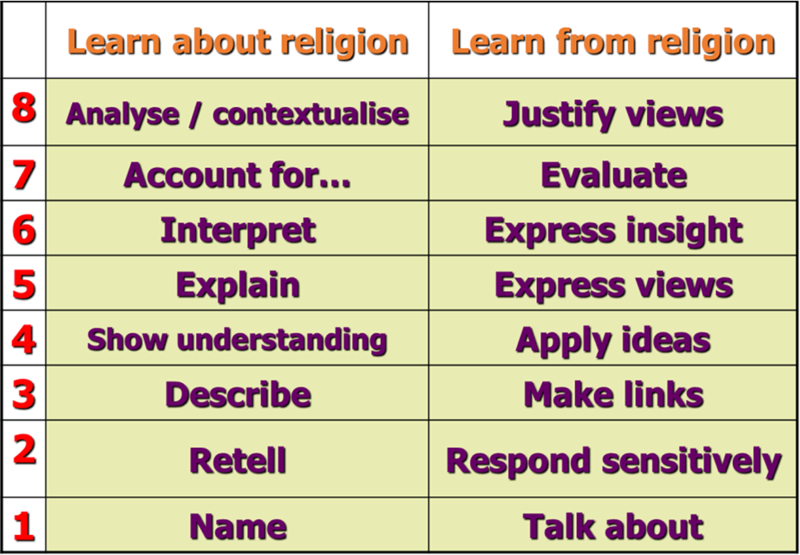 The school uses the LDBS scheme of work for RE which covers the six main world religions and a number of thematic units for Upper Juniors. The content of the curriculum is in the main part Christianity. Children have an hour of RE taught each week which is separate to the children’s entitlement for collective worship. Christianity Who made the wonderful world? Christianity Why is Christmas special for Christians? Christianity Why do Christians believe Jesus is special? Christianity Who cares for this special world? Christianity What does the Lord’s Prayer mean? Christianity Why are saints important to Christianity? Judaism What is it like to live as a Jew? Christianity Why is Good Friday good? Islam What does it mean to be a Muslim? Christianity What responsibility has God given people about taking care of creation? Judaism Why are they having a Jewish party? Christianity Where is the Light of Christmas? Christianity How do Easter symbols help us to understand the true meaning of Easter? Sikhism What do Sikhs believe? Hinduism What is the importance of symbols, beliefs and teaching in Hinduism? Christianity How do Advent and Epiphany show us what Christmas is really about? Christianity What are the miracles of Jesus? Christianity What makes a Christian? Christianity Easter people – Who is the most important person in the Easter story? Islam What are the 5 Pillars of Islam and why are they important to Muslims? Christianity What are the Beatitudes? Christianity Jesus and the gift of peace – is peace the most important message at Christmas? Christianity Should every Christian go on a pilgrimage? Judaism What does it mean to be a Jew? Hinduism What does it mean to be a Hindu? Christianity What do the monastic traditions within Christianity show us about living in community? Christianity What happens in churches at Easter? Christianity How has the Christian message survived for over 2000 years? Sikhism What does it mean to be a Sikh? Buddhism What does it mean to be a Buddhist? Christianity How would Christians advertise Christmas? What does Christmas mean today? In addition to the weekly RE lessons, a number of ‘Pause days’ are planned in for the year. These are opportunities for the whole school to come off timetable and reflect on a particular topic for the day. Pause Days have included Harvest, Easter and a Global Neighbours Pause day. These days will often be creative and thought provoking days including lots of opportunities to explore the theme through art, drama and other practical ways. Parents have the right to withdraw their children from Religious Education. Any parents who are considering doing this are asked to discuss it with the Headteacher. Children who are withdrawn will be supervised. In order to ensure that children’s attainment is high in RE and that they are making excellent progression we use the RE skills ladder below to monitor and assess the skills that the children are developing. Two year 6 RE advocates are selected each year to assist in gathering resources, assisting with assemblies and special services (e.g. Easter) and monitoring our school prayer stations. These roles give children the opportunity to take on a position of responsibility within a subject that they enjoy. The RE Steering Group supports RE and Collective Worship within the school. Each year two children who have a particular interest in RE are selected from each class in the Juniors. They are responsible for, amongst other things, assisting with assemblies and special services (e.g. Easter), preparing and leading acts of class worship and carrying out surveys. Each class has a reflection area. This is an area where children may go to be quiet and still. The school values will be displayed here and there may be a candle, a bible and other visuals to encourage children to think and reflect. Each class also has a cross which forms part of a prayer trail around the school.